1. the use of industrial GSM / GPRS communication module 850/900/1800/1900MHZ options, global coverage. 2.IMEI code query, set the requirements of different countries to facilitate the registration network. 3.equipped with integrated color LCD function display, date, clock, display and keyboard set, the query. 4. the host 5 groups alarm messages can be stored subscriber numbers, alarm messages in English and sent to the user the exact location of the police intelligence reports. 5. the host can be stored 5 alarm user group telephone numbers, alarm calls can be broadcast to the user while recording the scene and also on-site monitoring intercom. 6. arm and disarm the report user features SMS, ensuring correct. 7.Letter of support for flying capabilities. 8.Wireless doorbell function (any setting). 9.smart time arm and disarm functions. For accurate surveillance. 10. on-site intercom functions; support built-in two-way intercom function without external speakers, alarm or remote on-site staff yelling, duplex intercom. 12. intelligent recording voice broadcast 10 seconds of early warning, alarm, voice broadcast, enabling people to grasp the scene location information answer. 13.when the wireless linkage device with alarm, convenient linkage power, lights, video and so on. 14.external siren arming / disarming siren function of whether the ring. 15.audio alarm and silent alarm. 16.telephone remote control function; with any phone or cell phone can be controlled live arm, disarm, monitor, intercom, a / wireless appliance control output, system settings and other functions. 16.SMS remote control functions; via SMS to control the scene arm, disarm, a / wireless appliance control output, or inquiry, system settings and other functions. 17.can host keyboard, remote control, timer, SMS, telephone remote control, five models out arm, stay arm and disarm, and other functions. 18.can host remote query by SMS commands work status (such as; host name, arm and disarm, SMS / phone numbers, power and other state). 19. wireless detector with the host using learning style of the code, simple and convenient. 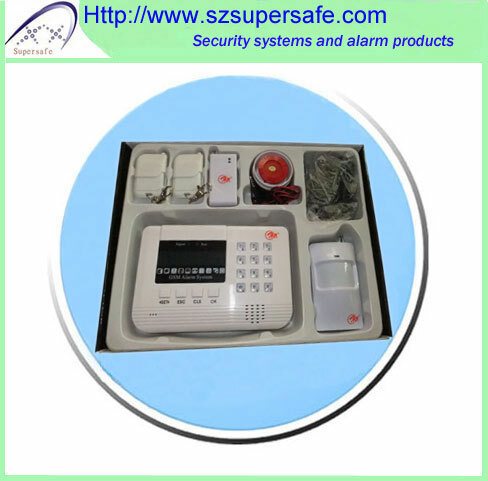 22.99 channel wireless zone can enter 99 different detectors (2262/1527 may be), can be set for each zone, peripheral zone sound alarm, silent alarm around the zone, internal zone audio alarm, silent alarm within the zone, 24-hour zones sound alarm, 24-hour silent zone alarm, zone alarm delay, disable zone (sub-zone arm and disarm), delete the zone, bell zone, 10 other types, to suit different occasions.